Are you looking for an interactive toy that your toddler will love? My Friend Teddy is perfect for 2 year olds and up. I can’t think of a better way to learn! Check out the full review here. 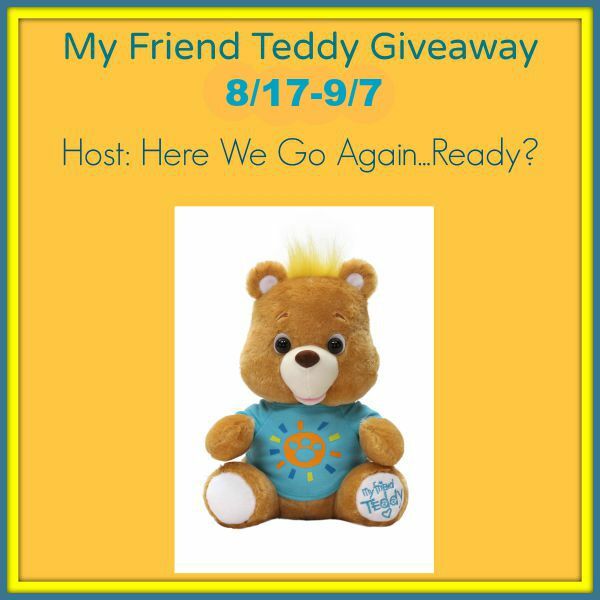 One lucky reader will win a My Friend Teddy! This giveaway is US, 18 or older. Only one entrant per household. Giveaway ends on 9/7 11:59 PM EST . Winner will be notified by email and has 24 hours to respond. If there is no response during that time a new winner will be chosen. Good Luck Everyone!!! i love the fact that it is interactive ! I like that MY FRIEND TEDDY features numerous activities to further enhance motor skills and language development, via interactive learning games, counting exercises while offering multiple degrees of complexity built in, allowing parents to adjust learning levels appropriately as the child develops. My favorite feature of the My Friend Teddy is how interactive he is! I love that your child can play games and learn through this adorable bear.